Losail (Qatar), 18 October 2015 – The Losail International Circuit hosted two decidedly exciting races. 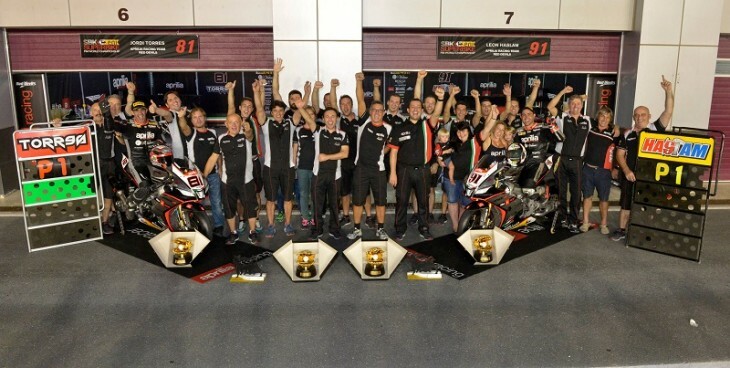 It was an all Aprilia triumph, with Jordi Torres sealing his first Superbike win in Race 1 and Leon Haslam winning Race 2. Leon Haslam was the protagonist in Race 2, after having to settle for sixth place in Race 1. Getting off the line well from the second row, Leon stayed in the lead group with a blinding pace (the fast lap he put on the sheets was 1’58.068) moving back and forth between first and second place. After a long duel with Davies, Haslam took advantage of his RSV4 RF’s better acceleration to overcome his countryman and win his second race of the season.